If you are building a MOTM system of about 20 modules or less, and are mounting it in a rack, you can use the MOTM-900 power supply with no worries. If you build a large modular system, or a custom case, or you are reluctant to give up 3U of front panel space to a power supply, you must think about providing your own power supply and power distribution system. There are several decisions you must make. Power supplies can be divided into two types - linear and switching. A linear supply stores its energy in fairly large capacitors that are recharged at the frequency of the incoming AC power. A switching supply uses proportionally smaller caps to store its energy, but recharges them at very high frequencies. Switching type supplies are used in all computers and are best for situations where high power is needed, but they can add noise to the power supply lines. Linear supplies are best when the lowest noise and purest power is needed. Even though switching supplies are vastly better than they were a few years ago, I will unequivocally state that you should use a linear type supply in your modular synthesizer. The MOTM designs go to great lengths to provide extremely low noise, so you don't want to add any with your power supply. Reasonably priced linear supplies are readily available with the current capacity to power large numbers of modules. Don't be temped to build your own power supply from inexpensive 3 terminal regulators such as the LM7815 and LM7915 series. This is a false economy. A good quality commercial supply is not that expensive, and is vastly more stable and protected against failure than anything most people can brew up themselves. You could fry every module in your system if your supply does something bad! Centralized or distributed power supplies? If your system has one cabinet, you obviously need only one power supply. If it is a large cabinet with many modules, you may need to choose a higher capacity supply than the MOTM-900. If you have more than one cabinet, you must decide between mounting a supply in each cabinet, or using one centralized supply capable of powering the entire system. you don't risk adding noise and drift by running long external cables carrying DC between cabinets. My view is that separate supplies are better from an electrical and logistical point of view. If I had two cabinets, I would definitely use separate supplies. If I had 4 or more, I might think about sharing power. You must have locking connectors that are electrically solid if you choose this route! How big does my supply have to be? When we talk about how BIG a power supply is, we are really talking about how much current it can deliver. MOTM modules require +15v and -15v DC, clean and stable. Each module is published with a power specification that states how much current it draws. Add together the power specs of all the modules that you wish to run from a single supply, and you have the minimum current necessary for the supply to deliver. Add a safety factor of about 1/3 on top of that, because you don't want your supply to be working at its maximum. It will run cooler and more reliably if you are not continuously asking for all that it can deliver. For example, say I have counted up the module current requirements in a cabinet and it comes out to around 900 mA. I would select a power supply that could provide 1.2 or 1.5A (1200 to 1500 mA), to provide a safety cushion. What power supply should I buy? How should I wire it up? 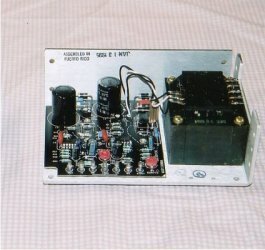 Pictured above is a typical open frame linear power supply. It is made by PowerOne, the same company that provides the core for the MOTM-900, and it supplies 1.5A of both +15v and -15v. It is large enough to power the 40 or so modules in my cabinet. You can find ordering information for this supply on my parts page. You can mount it in a wooden cabinet easily by making some small aluminum angle brackets and by taking advantage of the mounting holes in the chassis. These supplies typically can be wired to use either European or US voltages, by attaching the power wires to different transformer terminals. They come with instructions which show you what to do. The ground wire should be attached to the chassis. More wiring and power distribution info is on the power distribution page.